Police searched the Northern Virginia home of libertarian activist Adam Kokesh Tuesday evening and took him into custody, according to a news release posted on Kokesh’s Web site. Kokesh, a former Marine, was being held at the Fairfax County Adult Detention Center, charged with possession of schedule I and II drugs while in possession of a firearm, said Lt. Steve Elbert, a spokesman for the Fairfax County Sheriff’s Office. No additional details were immediately available. The search warrant was served by U.S. Park Police, a federal agency that is responsible for policing Freedom Plaza, the park on Pennsylvania Avenue NW where Kokesh was videotaped loading a shotgun, in violation of local gun laws, according to aYouTube video posted on July 4. 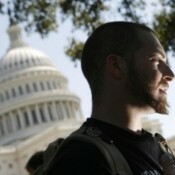 Post Continues: Gun-rights activist Adam Kokesh arrested in Herndon – The Washington Post.